The IPCC will die by a death of ten thousand cuts. It will take time – too much time – but it will eventually die. Consider this, parasites of any specie will not willingly give up their free lunch. In fact, they would rather destroy their host than do that. If they can’t have a free lunch, then no one can have a lunch no matter how much they pay for it – especially their hosts. So too the IPCC and its fellow travelers and useful idiots. We are going to have to figure out how to give them their ten thousand cuts without having to endure the hundred thousand cuts they have planned for us. The easy things have already been done. We have won the science. The really hard work of clearing the damage done to our fundamental principles, our language, our ideas, our laws, and our institutions has just begun. Unfortunately, history is against you. Gov’t birthed agencies never die; they simply are given ‘additional’ responsibilities along with an increased budget to cover the new remit. History is not a cause. It is a consequence of the actions of men holding to certain ideas. It is nothing more than a starting point for the making of a future. Hold to the same ideas, and the future will echo the past. Change the ideas that men hold and they will be able to create a future with a difference. Change the ideas to the right ones, the future can be better than its history. The interesting catch here is knowing what “right” and “better” means. This can be known but not by the methods used to create our current in process history. That’s funny, I thought one with the name Climate Commission (or something like that) was closed down quite recently? Well they no longer refer to them as responsibilities either. e.g. the EU is taking on (i.e. telling compliant governments of member countries to give them) additional “competencies”; perhaps not fully understanding the meaning of “competent”. Here’s a reminder of BIG (by John Brignell at Numberwatch). 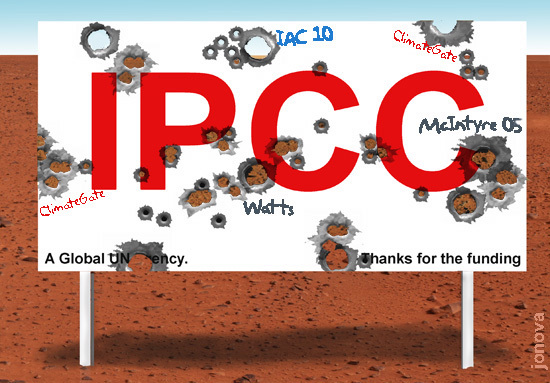 The IPCC will never die until the UN is dissolved. The IPCC is the big engine for implementing the UN’s social engineering programmes. The lesser ICLEI, etc designed to undermine national governments, implementing the UN’s Agenda 21 by employing Fabian methods, will disappear over time as their junket-fed supporters find fewer rewards, a collapsing support network for their fantasies and no prospect of climbing that ladder to the one world government because there will be nowhere to prop the ladder. I am sure you will have no argument from Mr Humphries – “I’m free”. With Mr Humphries in mind you could say “we have been served” a lot of crap for a painfully long time by the IPCC – time for this entity, which has no place in the real world, to be wound up – RIP IPCC – the sooner the better. This is going to be a very long road. The Global Warming Industry is not going to go quietly into the sunset. At almost $1.0 billion per day, the amount of vested interests in keeping the myth of CAGW alive and well is truly incredible. Then there are the antics of the gullible greenies – 5-10% of the population – who will believe anything, as long as it is something from which they believe they can try and save mankind or the planet. Catastrophic rising sea levels is/was such obvious BS, particularly when measured in terms of millimetres per year by satellites travelling at many thousands of kilometres per hour in elliptical decaying orbits. Russia at least understood that a new cooling period was coming and are building new nuclear powered ice breaker ships for river and sea use. Miller is right; the road will be long but the end is in sight. What new scare will the left dream up? If the road is long.. go as far as you can see. When you get there you will see how to go further. Ice increasing and over 3 metres thick. If the ice is that thick, the Icebreakers will not be able to free the ship. Oh, dear. Mind you it is officially summer down on the ice, so I am sure they will be airlifted off … eventually. Regular supply movements usually takes precedence, so they may have a bit of a wait, with only penguins for company. I am not smiling, really I am not. SBS news last night said the ice was starting to break up. I’m not saying SBS is correct, and they didn’t say where this information cam from. Probably the scientists themselves. No, the scientists themselves were starting to crack up. Apparently, none of them could get a triple word score at scrabble. Subtle difference, I know, but par for the course for the MSM. We’re stuck in our own experiment. These ‘climate scientists’ are geographically challenged. These is a river called denial in Egypt, not in Antarctica. Maybe they can’t read German, or have it interpreted @ UNSW! The Alfred Wegener Institute Antarctic Neumayer-Station III is a meteorological observation station that’s been measuring air temperature and other magnitudes in Antarctica for 30 years, which is the period of time used to define climate for a region. * For whatever reason the following Alfred Wegener Institute (AWI) press release was nowhere mentioned in the mainstream media. Stunner: Germany’s Alfred Wegener Institute Confirms Antarctic Sea Ice May Have Reached Record VOLUME! Seems someone rounded up the christmas turkeys and put them on a boat bound for Antarctica. Unfortunately, they didn’t get them all. I predict that after this fiasco we will see a new breed of Turkey/Penguin discovered in Antarctica as a result of boredom and feeble mindedness. All it needed was the right wrong mix of seamen. Another example of cooling temps in the Antarctic. Sanity returns as the money runs out,soon the negotiations will accelerate. For $85 I will protect and serve you”. But we always lose, as anything they get is a loss of productivity and an accelerated drag on the rest of us. And we always negotiate, when a rational response would be to treat them like the pirates they are. Identify the parasite, ask yourself: Do you negotiate with tapeworms? “Negotiate” and “compromise” are two very corrupted words. Their proper context is a voluntary interaction between parties holding to the same principles and values but disagreeing on the many necessary tradeoffs to reach a mutually desired and agreed to end. This context has been stripped away and all that is left is an aura that “negotiation and compromise” is always good so it always must be done no matter what the context. For example: don’t be extreme and always insist on eating good, nutritious food. Sometimes compromise and eat some poison so as to prove you are not prejudice against poison. So what if it causes you pain, suffering, and death. Why is that so important? After all, negotiation and compromise is the primary value and not your puny miserable individual life. Your being selfish and wanting to continue to live and live well is a trivially selfish desire not to be permitted in the new order of things. You must always consider the greater good…. In a negotiation and compromise between good and evil, evil always wins. Evil offers nothing but harm and destruction but gains what it could never create. Good receives nothing of value but must sacrifice that which is valued and necessary for continued living and thriving. Never drop context. The side effects can be disastrous and often fatal. Evil is counting on you not noticing their linguistic slight of hand to seduce you into you lose and they win situations. The Australian government’s resupply ship Aurora Australis is now en route to make one final bid to free the icebound boat and is expected to reach the Akademik at 11pm Australian time (1200 GMT). …The Aurora Australis has the highest icebreaking rate of the three vessels initially sent to the Akademik’s rescue, which also included France’s L’Astrolabe, but there is no guarantee it will be able to reach the Russian ship. …The Australian icebreaker can cut ice up to 1.6 metres thick but the Akademik is estimated to be surrounded by ice of between three and four metres. As reported here: Air rescue for passengers planned if final bid to free ship trapped in Antarctic ice fails. One cannot deny that the unfolding of events in Antarctica, aside from being replete with the fingers of the MSM ‘adjustment bureau’ is simply bursting with entertaining ironies. Like Joseph Conrad’s “Heart of Darkness”, I see the whole incident as a metaphor for CAGW as a failed doctrine, laced with delicious ironies that symbolise the hubris and stupidity of academia in general, and climate science as a discipline in particular. The initial reports on the failed rescue attempt by the Xue Long tell us the Chinese ship penetrated seven nautical miles into the ice pack, before abandoning the attempt six and a half nautical miles from the Ship of Fools. That means Thursday night the Ship of Fools was 13.5 nautical miles from the edge of the ice pack. This morning we are told the Aurora Australis has arrived and is standing to, with the Xue Long, at the edge of the ice pack, 28 nautical miles from the stranded Ship of Fools. Is it just me, or does that mean the ice pack has grown 14.5 nautical miles in three days? At the supposed height of the ice melt season? Is this yet another example of Global Warming? Apparently the sea ice can be pushed around by wind and currents. If the ice flows push together a ship which was previously in fairly open water can become trapped. More ice pushing up seems to have quickly surrounded the Akademic Shokalskiy and is still quickly accumulating. Shackelton’s ship The Endurance got stuck and was eventually crushed by the ice. So where did it come from and how did the sea ice get to the seaward side of the ‘Ship of Fools’? To be expanding on the seaward side the ice will have had to come from the seaward side … is there that much ice floating around out there far from the coast? It’s a film about a loose conglomeration of misfit characters headed for Nazi Germany from Mexico just prior to WW2. Perhaps it would suggest more convincing parallels to the present situation, if only the conspiracy theorists were correct and the Nazi’s had escaped prior to the fall of Berlin, and established their fabled base in Antarctica! Spooky. All jokes aside, I think this whole thing would make a crackerjack film. I even have a working title, in keeping with my Heart of Darkness analogy- “Apocalypse Postponed till a Date to be Advised”. So the good ship ‘Akademik Irony’ is trapped in ice up to 4 meters thick that the IPCC/CSIRO tells us shouldn’t be there. So much for computer meddling vs. observation. They are losing control of the narrative. People are going to notice the contradictions. Skeptic: You lot moan about Arctic sea ice loss but the sea ice in the Antarctic is increasing! Skeptic: Hey, why are you warmists going on an expedition to the Antarctic? Public: Heyyyyy… I know my attention span is very short, but… didn’t you say something earlier that was … kind of… different to that…?? Good news for property owners and their insurance premiums, thanks to adults in governments that replaced socialist menaces. And for the councils. Property values will remain high allowing council rates to remain high. When you own a property on the beach front you expect to pay rates proportional to the value. That is no surprise for anyone. But when you own a house and can’t renovate it, fix it, sell it. That’s a draconian situation that was not part of the expected purchase price. But why should you pay rates proportionate to the value? Every home owner uses the same services. Ah! But in the socialist minds it is all about the propensity to pay, not your demand level on the service. paying rates proportionally to the land value is the best measure of how a particular property benefits from the services provided. It’s long been known that this is one of the major factors in land value. Checking the value of a property’s land is an excellent way of determining whether it has been overdeveloped and possibly overpriced or underdeveloped. This makes little sense, speaking as a 36-year proponent of significant property developments … reads a bit like the warmista mantra, hot = more ice, cold = more ice. Statutory property valuations are an indication of nothing more than (1) the authorities wish for more revenue, and (2) an obtuse indication of selling prices. If you don’t believe this, ask any Brisbane homeowner how they felt about their statutory valuations two years ago that bore no resemblance to the market nor value. There has to be some rationality in this discussion on both sides. If people can build where ever they like, sooner or later they will build in places where long interval natural forces will damage their property. Then they will want help from the taxpayers. In our suburb the valuable coastal properties are protected by a sea wall paid for by a levy on all ratepayers. Is this fair? I sympathize. I presume and hope the sea wall and beach area are public access places, and presumably the other rate payers get some value? If the council informed people there was a future risk of high sea level rise and the council would not be building sea walls to deal with climate change (“buy at your own risk”) the free market would be at work, all cards would be on the table. That would be fair. But local beach conditions may cause problems that have nothing to do with climate change. If councils are normally responsible for dealing with local changes due to erosion or in response to poorly designed beachfront development (like jettys, sea walls, dredging etc that change another beach further away), that’s different. This is a great primer on sea level. Our local community on the Kapiti coast in NZ, has gone through the same issue with our council. I’m happy to say they have backed down, & have now removed the ‘coastal hazard lines’ from property reports. It involved a lengthy consultative approach, the removal of the former mayor (replaced by someone who was prepared to listen), a case being taken to the high court,& the testimony of numerous professionals. At the end of the day local communities can decide their future for themselves. Disregarding third party ideological zealots from outside of these communities. David Suzuki has a very expensive home on the water front, millions, in a very trendy Vancouver neighbour hood, part owner of a piece of an island, and so funny the other owner is an oil company. He also has a home on Quadra island. So do as I say, not as I do. Tom Foolery has two Hawkesbury River properties, tidal area north of Sydney. You know who he is, the team leader at the privatised climate office charity. - Ice-sheet mass balance and climate change, published in the journal Nature – confirms that Antarctica and Greenland are both losing ice and contributing to rising sea levels. It’s chopping off the extreme projections, it’s brought the future contributions to sea level rise right down to the core results that the IPCC [Intergovernmental Panel on Climate Change] last time produced, which is still a very great concern,” Ian Allison, an Honorary Research Professor at the University of Tasmania said. With sea level (sort of) disposed of maybe we need to turn our attention to our privacy in this digital age. James Bond lives on. The snooping level is definitely rising. What can I say, but “LOL”. IBM and MS were shrinkwrapping backdoors at least as early as 1990. The 1999 leak of the “_NSAKEY” is legendary. This collaboration on endpoints has all been going on a long, long time. What Mr Snowden revealed was just how large it has escalated in the previous 10 years, so yes the level is rising just as you say. Now the makers of the components inside Android phones and iPhones are under suspicion, as well as the “random” number generator inside Intel CPUs. Despite a media hyping campaign of nearly climatesque levels, the response from the public has been barely more than a mildly rebuffed murmur. This indicates there is some kind of social bargain we have struck with Government and have accepted on some sort of don’t-ask-don’t-tell Blissful Ignorance basis, which is now somewhere between impossible and uncomfortable to renegotiate. It is fear bartering. We are trading insurance against one type of fear for insurance against another type, but renegotiation is not even conceptually possible when nobody wants to talk about the probability of the Other Fear that the alternative course would mitigate. I guess you know that I’ve struck no such implicit bargain as this with anyone, least of all, my government. Had I any suspicion that my PCs, any of them, had been bugged or hacked, I’d take my ax to the thing right away. The same for the several computers for which I have responsibility at work. This is clearly a bridge too far; blatantly unconstitutional and I don’t know why anyone like Microsoft or Dell would agree to be complicit in it. Damn the bunch of them and the NSA too. The situation is bad enough that nearly every application suite in the world goes out to the Internet as soon as you launch it for reasons never disclosed. I can block any of them with my firewall and I do block some of it because there’s no good reason to tolerate it. Even Windows tries to connect to something. Amazing how the whole world thinks they own what is still named, now I guess, erroneously, a “personal” computer. So much for the personal remaining personal. PC should stand for Public Computer. The research paper is being published in the journal Nature Geoscience. It is obvious where the UNSW climate scientists get their data. No wonder the turkeys are stuck. “Research into Australia’s unique climate has proven invaluable in dealing with bushfires and other extreme weather threats. Today, as we face the ever-more urgent threat of global warming, Australia’s network of climate scientists is world class. Alongside BOM and CSIRO, many of our universities are active in ground-breaking research … work on developing technological solutions for a warming world. Shouldn’t we also listen to what it says about global warming? All of the world’s major national science academies have endorsed the view that human activity has played a dominant role in global warming. A recent review of almost 14,000 peer-reviewed scientific papers on the subject over the past two decades found that 99.8 per cent supported that position. Australia needs a Royal commission into the state of science in Australia. Particularly ‘climate science’ as this effects legislation. No legal person without professional engineering qualifications should be involved in a Royal commission but unfortunately the legal system with so many lawyers in parliament always finds a way around to skew results so they benefit at the expense of the long suffering public. Look at the Royal commission on the Brisbane floods -no one has been prosecuted although several technically unqualified Labor ministers (including the Premier) who were responsible for setting dam levels and restricting the responsibilities of the operational engineers. How much does this affect sea level rise? If it all re-freezes in the following Winter then absolutely none. No study has shown that the Antarctic is contributing much to sea-level rise. The most recent (search on Bing on the text below) estimated that Antarctica was melting at the rate of –87 +/- 43 billion tonnes a year between 2000 and 2011. That is adding 0.24 +/- .12mm per year to sea level rises. Each new study is less than the previous. Also, Antarctica is around double the size of Australia (14m km^2). Has a research scientist, for a single paper, done samples along the entire coastline, and averaged them? A Reconciled Estimate of Ice-Sheet Mass Balance – Andrew Shepard et al. Hmmm, 600 years ago was during the decline of temperatures going into the Little Ice Age. When it’s getting colder where it is already cold, it’s not surprising that hardly any melting occurred. Fast forward to 1950 and 200 years of emerging from the LIA. The rate of melting increases. Surprise, surprise. All perfectly natural. Sorry, CO2 didn’t do it! Sorry, 100 years of emerging. Yes it will all die slowly but what I find galling is that there will be no adverse consequences for the perpetrators of this scam. The worst that will happen is that eventually their funding will get cut off but in many cases they will continue to be funded, and the whole edifice of government-funded science and media will just go on looking for another pretext, and when that vein is mined out, another one and so on. First, as concerns the state government decision, this again smacks of a cunning deception by the leftist Liberal government of New South Wales to appease the mainstream community but without actually doing anything of substance (just like the deceit they have engaged in to conceal their cowardly response to street violence). It gives them the headline they are looking for, but if you look behind the headline you will see that, as usual, there is nothing of substance. In this case the weak NSW government has done nothing to limit the power councils have over property owners generally, but especially in relation to this sea-level-rise nonsense. The councils still have arbitrary planning powers, rather than being limited to disallowing development only in cases where the rights of other property owners are demonstrably affected. Here we are in the 21st century and still we are subject to laws that are so open as to give arbitrary power to the state, just as it was hundreds of years ago in feudal Europe. This is the same leftist Liberal state government that is still wasting our money on renewable energy and burdening us with punitive cost-of-living increases. … the Liberal Party’s candidate for Hume Angus Taylor is urging his party to back off supporting wind farms. Well, Angus Taylor, you are now the elected member for Hume and your party is in government. What are you going to do about it? If the Abbott government is too spineless to repeal the renewable energy targets, why not stand on principle and introduce a private member’s bill to repeal the legislation? You will find willing backers within your party’s elected ranks. If we don’t get a result from the Abbott government, just as we haven’t from any of the Liberal state governments, let’s hope that newly elected Liberal Democrats senator, David Leyonhjelm, can move the Liberals back from the left towards the mainstream. Returning to the matter of sea levels and local government, you have to consider more than one possibility when councils tamper with property ownership rights in the name of dodgy science. It is, of course, entirely possible that the councillors have believed the climate change lies peddled to them by the leftist media, but that does not excuse their meddling with people’s property ownership rights. It is probably more likely that they are leftists who have an obsessive mindset on the subject of global warming. But there is a third possibility that should always be considered. As Jo has often said, ‘Follow the money trail.’ When we hear of councils meddling with property ownership rights in the name of ‘protecting people’ from rising sea levels, take a good look at whom the main beneficiaries would be. For example, if councils were to compulsorily acquire waterfront properties in the name of mitigating the ‘future impacts of climate change’ (it’s always in the future, isn’t it? ), I would be looking at who had been buying nearby properties that might then become absolute waterfront properties if councils proceeded with their acquisitions. I would also be looking at the relationship between people acquiring property and the councillors. Government has put a huge pool of money on the table in the climate change game, and, just as will happen in nature when a new food supply suddenly emerges, predators and scavengers will rush to exploit it. Think of all the hyped up energy projects willingly given billions of taxpayers money by governments around the world, and then picture the long list of energy projects lying abandoned and bankrupt after their spruikers withdrew ‘administrative expenses’ before moving on to talk up their next scheme. And think of the billions in research money offered to scientists who only need to say what is expected of them. And don’t forget the predators who were cunning enough to see there was a fortune to be made from books and DVDs peddling scare stories to the gullible. “We just had a bushfire through and these turbines increase that risk. They also stop aerial bombing. Helicopters and stuff can’t fly within a kilometre of them. Another black mark against the useless windmills. Contracts signed and other red and green tape put in place in NSW during 16 years of Union Labor Green. It boils down to one question. Are people like this professor Fred Hilmer as stupid as this article would suggest, or are they liars exceeding our Gillard in magnitude. It does seem unlikely that someone so stupid could be running a multibillion dollar organisation, but then I suppose it depends on the field of candidates they are selected from. Even so it seems unlikely the entire field of vice-chancellors, world wide could all be this stupid. This of course leads us to the unpleasant thought that almost to a man/woman, vice-chancellors, world wide, are prepared to tell barefaced lies, damaging every sector of human endeavor, just for the cash it brings to their organisations. It really is time for a very large number of academics to be at least dismissed, & probably incarcerated for their dishonesty. It’s all about the money … Hilmer and his ilk have got fat on the handouts and this is more evident when you look at their remuneration from the ‘universities’ for exactly this level of fraudulent behavior. A Royal Commission into ‘climate science’ and its funding is long overdue and the bastards should be jailed for fraud. I would opt for stupid, given his proven history. The agriculture sector bounced back in 2013 after a drought year as the country is set to harvest record foodgrain production of 260 million tonnes because of good monsoons and achieve 5 per cent growth. … not if you’referencing ‘BoltA’ as a source. 1) Insurance is usually annual, so even 9mm a year will not make much difference in risk from one year. 2) Most beach-front properties (in Britain at least) are more than a metre above the highest high tide. The reason for not being able to get insurance is purely that insurance companies have limited resources. If governments, based on the “best” scientific advice, refuse to give planning permission because of increased risks in certain areas, then insurance companies will not take the risk. In the UK, when a professional person gives flawed advice based on biased opinion that resulted in financial consequences for the people who followed it, then that person can be sued. Should not scientists who make predictions that are not evidence-based, (and then governments follow that flawed advice) be similarly liable? After all, we are told we should follow the expert opinion of scientists by the likes of John Cook in a similar way to following the advice of a financial or medical professional. In September, Inside Business and Cox Business co-sponsored a sea level rise conference that drew roughly 250 attendees. In this discussion on the predictions of the climate catastrophists there are a number of trends emerging and none of those trends favour either the eco-nazi greens and the climate catastrophists. Dr Judith Curry, the owner of the quite respected Climate etc Blog has often posted articles on her site that go into the ethical and morality issues that the global warming catastrophe scientists like to very self righteously indulge themselves in as the good and virtuous saviours of mankind and the planet. Her latest couple of headline posts below with many of a similar theme in similar past headline posts. Kevin Anderson seems to view only one role for scientists – the Advocate – whether scientists choose to engage or be silent. Gavin Schmidt sees the choice between Pure Scientist and Advocate, whereby anyone who engages has values and is therefore an Advocate. Tamsin Edwards is a proponent of engagement but not of advocacy, putting her squarely in Science Arbiter box. As for moi, I engage and get involved in policy discussions but do not advocate, putting me further towards the (new) Issue Analyst box than is Tamsin. The message emerging from many of Dr Curry’s posts and comments [ lots of scientists from all sorts of disciplines on that site and you have to be quick and have a thick skin to post there ] is that climate catastrophe science as promoted by those same self centred scientific pursuers of publicity and fame of every description is really starting to impact on the public’s perception of science of every type. And the message from much of Judith Curry’s posts and comments is that respect for science is starting a precipitous fall in public respect as the public starts to become aware of just how corrupted and corrupting so much of climate science and anything connected with it as well as anybody who in any way is connected to some aspect of climate catastrophe science are to be suspected of having ulterior motives that are far removed from the interests of the public and far more inclined to boost the climate catastrophe promoter’s own personal power, influence and financial well being at the public’s expense. Science, particularly anything remotely connected to climate science ; ie Sea Level rise as just one such example, has become an object of increasing public cynicism about the true motives and honesty, morality and ethics of those who go about promoting the climate catastrophe meme. We can take this a little further when we take a look at the latest Alexa web site data on the relevant rankings of the skeptical and warmist promoting sites. These figures can shift around a lot but there is a rapidly increasing trend in there if you follow the Alexa data that clearly shows that the world wide public’s belief in the climate catastrophe meme whaever shape that meme happens to currently consist of, is rapidly falling off the cliff face of the public’s concern and interest. The “end is nigh” but it is not “the end” the climate catastrophists ever believed in their arrogance and cult like belief that they and they only were right, would ever come their way. A small survey result which shows a fall for all AGW blogs? Last is up but not primarily AGW. I’m pretty sure earlier this year KK and someone else from this blog attended one of these council meetings on sea levels. Sorry to be obscure but I thought it could be relevant. … and where is that idiot that used to attend here who was the leftie councilor all in favour of these ridiculous council regulations ? Yes I went to two meetings which attempted to drag members of the Local IPCC Branch (aka Lake Macquarie Shire Council) into a new scientific reality. Unfortunately it failed but Cohenite made a big splash at both public meetings and got some of the trendy left LMSC employees noses out of joint. The damage done to individuals by the LMCC action was described by a number of speakers and it was nasty stuff. People still do not want to accept that ocean levels have been falling for the last 8,000 years. Somehow the SBS or ABC let a bit of info get through which illustrates this point. On a show hosted by David Suchet about the life of Saint Paul it was noted that the harbour at Ephesus was now dry but 1900/2000 years ago would normally have had up to 100 ships in port at any one time. Thanks KK, I knew you had mentioned this at some stage (the old memory’s still OK) but wasn’t quite sure. I would have loved to have been at those meetings as people forget that public debate/confrontation used to be quite common in this country and was seen as a right and accepted as a practice by the public. Probably a good time to get local councils to reverse the dune stabilisation progams and give us our beaches back to the size they were prior to said stabilisation! Is it just me or have the trolls vacated the premises? Michael the Gullible only comments on a post the day after tomorrow. The trolls are probably stuck on the MV Akademik Shokalskiy, they can’t post either as no legible transmissions have come from that bloody tub yet! Noted that and asked myself the same questions. Further question; I’m a newbie here and have only been on this site for a few months after the WeatherZone climate forum was closed due to the savage warmist trolling. I’ve noted and may be very wrong but since coming here a few months ago there seems to be a steady and continuing change to a much better science based, informative and expansive posts appearing and being dissected and discussed here on Jo’s site from a whole range of posters over the last couple of months along with a lot less “me-too-isms” appearing. If that is the case, all credit to all those posters who both go to the trouble of researching their posts carefully and who try to make their posts informative, interesting and with some humour and wise cracking thrown in for interest and entertainment. It makes a huge difference and a considerable increase in the influence of a site to the way a site and it’s aims are presented when viewed by the lurkers and casual passer by’s. What I really do miss is the ability to present graphs and pics to illustrate and expand on my posts. But Jo’s Alexa ratings are a pretty good indication on how this site is regarded and it is first the Principle of the site ; ie Jo in this case, who sets the scene and theme of the site and then it is up to the posters and contributors and their attitudes and contributions which will eventually make or break a site. Where is John of UWA fame … the co-ordinator [snip] ? It is good to see that the State Government has ceased believing all that flannery about huge sea rises, but it will do little good. Any council dominated by Greens will ignore the directive. Any council with a Climate Change Officer, let alone an entire Climate Change Department, is not going to follow the directive. The answer lies in Manicbeancounter’s observation that “In the UK, when a professional person gives flawed advice based on biased opinion that resulted in financial consequences for the people who followed it, then that person can be sued”. Rather than go after some scientist – go after the Council. Sue them for the loss of value of the beachside property. Back it up if necessary by making the Councillors and the top Council managers liable if they ignore the Government directive. This will counteract the preventative procedure used by the Greens to stop any activity they don’t approve of, such as ordinary citizens occupying desirable sea side land which should be used for mansions for “true believers”. Road back to reality? The public do not even know there is a road. Wake me up when the public by and large want and demand global warming alarmist leaders be put behind bars for a long term for committing the biggest scam of all time, and that demand is carried out by a government with the guts to pull it off. At the moment neither is reality. The “Warmists” scare mongering on SL rise has been shattered by a consistent eustatic SL rise of 2-3mm/year. I recall Penny Wong’s alarmist warnings some years back predicting “that SL would rise by 1.1m by 2100″. How wong Wong – wery wery wong. As for Al Gore’s predicted 6m SL rise in his movie “An Inconvenient Truth” – what a joke – this movie won an Oscar in the Documentary Category. He can keep the Oscar but how about changing its status to the “Fantasy Category”. One of three rescue vessels involved in the mission, China’s Snow Dragon, sent a helicopter Sunday over the Shokalskiy, a Russian-flagged ship, to assess the ice condition. “From the air, only a very tiny glint of the deep blue sea water is visible,” Xinhua News Agency journalist Zhang Jiangzhong reported. “The whole area around was covered with ice. Spirits on the ship appeared high, with several members of the team posting video diaries on YouTube. “We’re all having a good time here. The morale on the boat’s excellent,” Nicole de Losa said in one, adding that there would be dancing and singing on the ice later. The 15-year-old’s design was deemed the very best of thousands of entries from across the country in the Doodle for Google competition. For her award-winning design, Olivia wins a Chromebook and $10,000 worth of technology for her school. GoogleNZ: This year we’re incredibly excited to be working with Voyager Maritime Museum to host our finale and exhbit our National Year Group Winners’ doodles, and ASB who are sponsoring the Antartic Expedition prize. Professor Chris Turney is an Australian Earth scientist. He holds a prestigious Australian Research Council Laureate Fellowship at the University of New South Wales where he is exploring past climate and environmental change from the tropics to the poles to better understand the future. In 2004, Chris led the radiocarbon dating on the ‘Hobbit’ fossil of Flores, Indonesia that hit the headlines worldwide. He has written numerous books, scientific papers and magazine articles, and given frequent media interviews, thanks to his infectious enthusiasm for working out what happened when. At 39 years young, he has received numerous awards and been described by the UK Saturday Times as ‘the new David Livingstone’. His most recent book is 1912: The Year The World Discovered Antarctica, published by Text Publishing, Melbourne [web link: http://textpublishing.com.au/books-and-authors/book/1912/. You can follow Chris and scientific exploration on +Intrepid Science. Timmy Flim Flame will surely help his local council get their facts straight for his waterside place!! Vote now and tell us in the comments below who you think is deserving of the prize. how extraordinary our MSM has not been carrying updates at the top of all tv/radio news daily & in every news promo. this story has got everything. stunning visuals, aussies involved, worldwide interest, suspense, etc! About 6am, the Aurora’s captain, Murray Doyle, began to manoeuvre the icebreaker through thick wedges of consolidated sea ice. But by 9am [midday Sydney time], the master made the call to turn the ship around and move back into open water. Captain Doyle also feared that the 55-kilometre south-easterly wind running up the ship’s stern would blow ice in and around the back of the vessel. “It was pushing those same types of floes in behind us,” he said. “If we got into that compact stuff it would have sealed us in, we would have lost our manoeuvreability and we wouldn’t have been much use to anybody. “Having been caught in ice before, I know by experience when to get out. I didn’t want to add to the drama, instead of being part of the solution,” he said. “We also can’t use the helicopter at the moment because there is no visibility,” he said. “They’re trying to make it back into open water so they’re not trapped as well,” Captain Doyle said. Sounds very serious. If anyone dies who is responsible? IPCC for giving them false information? Speaking of MSM Canada’s CBC has for most part ignored this story also unless I missed updates. CBC has the same ethics as the BBC and ABC. someone has posted the nicky phillips’ piece on wuwt from a nz website. right now, with the latest dramatic developments, my google news page, weighted to australian news, has nothing whatsoever on this story. it is beyond shameful. this entire incident – and the lack of MSM coverage – is the greatest proof we’ve had yet of the complicity of the MSM in the CAGW scam. Using actual observational data can be risky because according to a paper now being contemplated somewhere, sea level rise is actually hiding somewhere just east of Alice Springs. There are no tide gauges just east of Alice Springs so that is why this has gone unmeasured but rest assured that at some point in the future this hidden sea level rise will burst out of hiding and inundate the beaches of Australia (and Brisbane in particular) and cause a massive loss in property values. It is imperative that construction in all areas with a decent beach vista be curtailed immediately except for the building of villas for Labor party glitterati (and maybe one for Al Gore), hotels and golf courses. It is absolutely of the utmost importance that people do NOT pay any attention to the unadjusted observational data as that can be extremely misleading and should, instead, pay very close attention to the data output from our models in which we have invested great expense. This sudden change in policy is direct proof that Australia’s newly elected government is secretly receiving vast sums of money from multibillionaire oil tycoons such as Anthony Watts, Steve McIntyre, and some guy named Chefio. Do not let your decisions be swayed by actual data. This is a major mistake and could end up throwing thousands of people out of work and result in the destruction of entire global bureaucracies. Our models are based on the very best peer reviewed science and we must keep that gravy train rolling to the peers. Am I to believe that this above paper by Kevin Trainbreath was peer reviewed by Proff’s Michael Mannikin, Tim Flannelettes and Fred Hills-Hoist? They must all now be praying for Thermogeddon.